Discussions Magazine Music Blog: STEREO SKYLINE/Stuck On Repeat: Avalable July 20th, 2010! 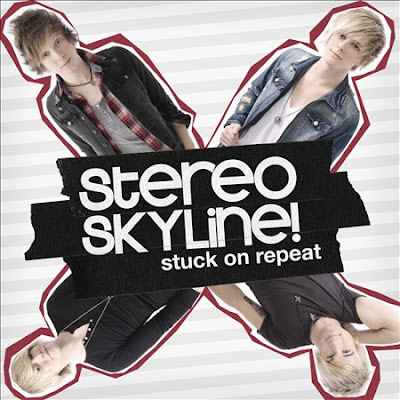 STEREO SKYLINE/Stuck On Repeat: Avalable July 20th, 2010! Since 2006, Stereo Skyline have released an EP, been a mainstay at The Bamboozle festivals and been touted as on of Alternative Press’ “100 Bands You Need to Know in 2010.” The Long Island, N.Y. natives, who are not even old enough to drink, have also shared the stage with the likes of Hanson, Cartel, All Time Low and Boys Like Girls, and been a part of the Take Action Tour and Bamboozle Roadshow. Now, after four years of mounting accomplishments, Stereo Skyline is ready to release their highly anticipated debut album, Stuck On Repeat , on July 20, 2010. To enhance the band’s pop instincts, the group worked with a variety of songwriters and producers on Stuck On Repeat , including S*A*M and Sluggo, Metro Station’s Blake Healy and Fountains of Wayne’s Adam Schlesinger. Recorded in both New York City and Los Angeles, the album is a compilation of collaborations, which as the title denotes, get stuck on repeat in your head. The album title is also a lyric from the band’s first single, “Tongue Tied” (co-written by Healy), which is about a guy who’s apprehensive about talking to a girl he sees from afar. “The scenario has probably happened to every single person in the world,” Bard says. “They see somebody and are like [gasp], but they don’t actually go over but they wish they did.” The band also gets a little help on the single from their friend Cassadee Pope, lead singer of Hey Monday. Although audiences won’t hear her sing, the 20-year-old does lend her voice to a part of “Tongue Tied” that involves a phone call between a guy and a girl. One of the best examples of Stereo Skyline’s innate pop sensibility is their song “Heartbeat,” which was released on their self-titled EP and re-recorded for Stuck On Repeat . The song was written by Bard when he was just 15 years old, at an age when he humbly says the band “didn’t know how to make pop music, or any music rather.” However, the infectious single remains Stereo Skyline’s most recognizable song and fan favorite.